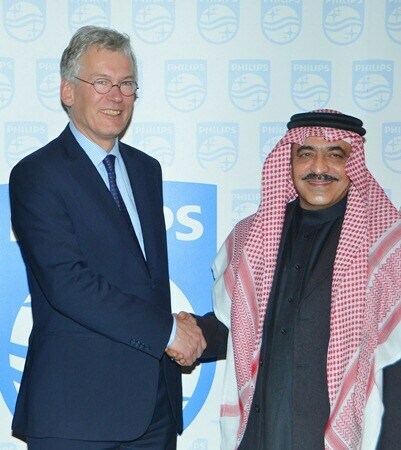 Riyadh - Kingdom of Saudi Arabia – Philips Healthcare Saudi Arabia today announced signing a 6-year partnership with Associated Medical Enterprise Company (AMECO) to improve the delivery of care and patient outcome at the Obeid’s hospitals. The new deal covers Obeid hospitals in Riyadh, Jeddah, and Hofuf. This comprises installation, maintenance, upgrading and replacement of most of the medical imaging equipment (MRI & CT) and partly delivery of new equipment and solutions e.g. Ultrasound, Patient Care & Monitoring Solutions and X-ray. “The healthcare community in Saudi Arabia is dynamic and changing as the patient care is rapidly increasing,” said Mohamed Mostafa, Head of Philips Healthcare, Saudi Arabia. “This agreement provides AMECO sites all imaging and ICU/CCU equipment and solutions in Riyadh, Jeddah & Hofuf, with a long-term comprehensive maintenance agreement, aimed to increase patient throughput and overall operational performance. Philips and Obeid hospital are committing themselves to work together and enable the high innovation pace that is necessary to address future health care challenges in the private sector." First Ever Digital MRI, Designed for first time right imaging and increased patient comfort for a faster workflow. The new Multiva 1.5T system is designed to deliver all-round MR application capabilities with high quality and high reliability. With a 60 cm patient aperture, proven SENSE parallel imaging and new high-channel RF receive coils, it is equipped to deliver superb image quality in short acquisition times. With advanced imaging capabilities, iCT SP is your entry into the Philips premium iCT family. The system offers high image quality at low dose through the iDose4 Premium Package, which is powered by iPatient to put you in control of innovative workflow solutions. It is designed to help you drive and keep referrals through excellence in patient-centric imaging. Ingenuity Core provides low-dose, high-quality imaging, along with the ability to personalize image quality from patient to patient. With advances such as the iDose4 Premium Package and iPatient, which puts you in control of innovative workflow solutions, the Ingenuity Core provides excellence in routine imaging, with consistent image quality across a range of patients. Ingenuity Core offers in-room upgradeability to Ingenuity Elite and IMR, so its capabilities can grow as your needs grow. The Juno DRF 2-in-1 combines the best of both worlds – everything you need for digital radiography and fluoroscopy applications, in one system. It addresses the common dilemma of the dedicated fluoroscopy room – idle capacity. With its dual imaging mode and unique open access design, it not only increases room utilization, but is perfectly positioned for bariatric studies. › 1 PCMS Package of Monitors, Ventilators, Anesthesia Machines, Defib’s & ECG’s. Patient care and Monitoring solutions for ICU, CCU, OR departments that feature network connections and central stations, along with Philips’ latest Ventilators with both Invasive and non-invasive capabilities optimizing the workflow and patient care. Also, the latest Anesthesia solution accompanied with the latest monitoring capabilities. In addition, the Cardiac clinics have been equipped with Philips high-end ECG machines and latest defibrillators.